We invite you to take part in this rare and transforming experience. 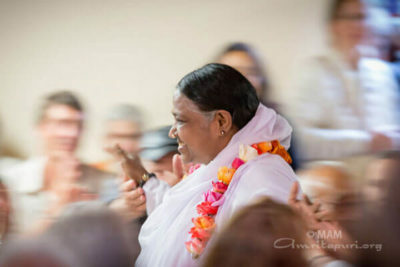 Today thousands attend Amma’s programs around the world in order to receive her blessings and wisdom as she shares her inspiration with seekers of every kind. Amma spends her days and nights offering darshan, or spiritual blessings in the form of a hug. Over 36 million people throughout the world have received her darshan. Retreat days can help to intensify our spiritual practices, allowing us to go deeper within ourselves without the distractions of our everyday lives. During a retreat, regardless of the size, the atmosphere always feels more intimate and relaxed. Retreat check in begins at 4.30 pm on the first afternoon and continues throughout the evening. The second and third mornings begin at 6am with an optional gentle yoga class followed by a 30 minute guided meditation led by one of Amma’s senior disciples at 7.30am. Following the meditation and breakfast, one of Amma’s senior disciples gives a class. On the second evening, Amma leads a meditation which is followed by a special Question and Answer session and then she serves everyone dinner. The IAM – Integrated Amrita Meditation Technique® is offered during the retreat at no extra charge. A refresher class will also be offered for those who have already completed the course. *Programmes and times are subject to change. Contributions towards Amma’s 2019 Australian tour are always appreciated. Funds raised cover the costs including airfares, transport and hall hire for public programs. It is through your generosity that Amma’s visit to Australia is possible. If you would like to make a donation towards the tour, or Amma’s charitable works your contribution can be included with your registration for the retreat. Noosa Leisure Centre, 9 Wallace Drive, Noosaville, QLD 4566. The Noosa Leisure Centre, Noosaville is on the doorstep of the beautiful Noosa River and close to the spectacular ocean beaches of Noosa Heads, Queensland. It is an ideal location for both the public Devi Bhava program and Amma’s first ever Sunshine Coast retreat. The Centre is approximately one and a half hours drive from Amma’s Brisbane venue and half an hour from Maroochydore airport. This retreat is on Friday April 26, Saturday April 27 and Sunday April 28. The final program on Sunday April 28 will finish early in the morning on Monday April 29. There is no accommodation offered at the Sunshine Coast retreat as part of your retreat registration. Your accommodation must be booked separately. All meals at the retreat site are included. Full payment must be received in order to process your registration. We only accept payments by Visa or Master Card. There is an early bird discount that ends at midnight on Wednesday April 24 so please be sure to register before then to get the reduced rates. No concessional rate, partial or one day retreat participation is available and no refund of any portion of the registration fee is available for late arrivals or early departures. Work exchange is not available for the retreat. Everyone gets to participate in doing Seva (selfless service) as part of his or her retreat experience. We ask you to register as soon as you know that you are coming. Last minute registrations place a great burden on the volunteer registration staff. Please do not contact the retreat venue or their staff directly. All questions and comments must be directed to: sunshinecoastretreat@ammaaustralia.org.au . Cancellations must be made by email only to: sunshinecoastretreat@ammaaustralia.org.au and received no later than 4.30pm Wednesday April 24. There will be a $40 per person retreat cancellation fee. No refunds will be made if cancelling after 4.30pm Wednesday April 24.
Credit card refunds can only be made to the account charged for the original registration. Transferring between retreats is treated as a cancellation & requires that you pay the $40 fee. Retreats with Amma can be a wonderful experience for young people of all ages and there will be some special activities for children and their parents available during the Sunshine Coast retreat. Children are not allowed to roam the retreat unattended so please watch them carefully. Also please respect the quiet time during meditation with Amma after the evening bhajan and before the morning darshan. Your cooperation will help to create a spiritually uplifting experience for all of Amma’s children, big and small. Children 17 and under who attend a retreat without their parents MUST provide a signed “Temporary Legal Guardianship” form, available from: sunshinecoastretreat@ammaaustralia.org.au. You will need to contact us to be given instructions on the registration procedure for minors. Bus transport from Brisbane to the Sunshine Coast retreat venue is available one way only departing Friday April 26. Cost $35. If you require this service you must include this with your registration fee and mark the box on the registration form. Pick up 2: Carpark, Gayford St & Albany Creek Rd, Aspley Hypermarket Shopping Centre (convenient to accommodation in Aspley, Carseldine and Chermside) at 11.30am. In order to receive the reduced early bird rate for the retreat your registration must be received before midnight on Wednesday April 24. Cancellations must be made by email to: sunshinecoastretreat@ammaaustralia.org.au and received no later than 4.30pm Wednesday April 24. Once you have registered online you will receive a confirmation email sent to the email address nominated when you created your account.